Monday's plan was to get ourselves to High Street Kensington and then to one of the museums on our list. Never made it to a museum. Once again we enjoyed a leisurely, chatty morning before catching the tube. All transport I mention was via my Freedom Pass, a real perk for Londoners over sixty like Michael and me, and Cheri's Oyster card with its full week top-up. After she bought it on Friday, there wasn't a day she didn't travel by tube, train or bus, and her Oyster saved both money and time. The card itself was £5, which would have been refunded at the end of her visit had she chosen to hand it in. We didn't even make it out of the station at High Street Ken before we were lured into a shop by its window display. Cheri did buy the leather belt she'd spotted on a mannequin, one of many temptations Kew presented us with. I'd succumbed on other occasions, but held off this time—with the thought in mind that I can always return even if I never do lose the five or ten pounds I'd like to shed. 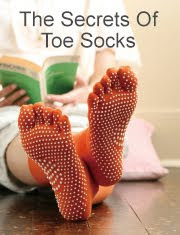 I did, however, pick up a pair of socks at Tabio, which may sound Italian but is actually Japanese. 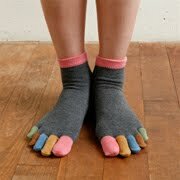 My choice was a pair of relatively conservative medium-stripe knee-highs, but I could have been far more experimental. When Kate next gets to London, I'll have to take her here. The actual reason for our trip to this part of London was to get a registered front door key copied at Banham's so that Cheri and Hans would be able to get into our flat, a good idea whether we end up in Jakarta or not. While this was being done, I introduced Cheri to my favorite supermarket, Waitrose, a few steps down the road. Marks & Spencer was next, where we both tried on a number of things that, as so often, looked good on the hanger but not on us. I did manage to find one navy blue blouse for spring. At least it wasn't black or grey, Michael, so I followed your injunction to stay away from the non-colors I always gravitate toward. Lunchtime and quick browse around the upscale London branch of Whole Foods. We bought traditional homemade Cornish pasties this time, a wedge of white Stilton with cranberries, and bottled drinks before heading upstairs to the food court where customers are also allowed to consume WF purchases. By the time we got outside again, a chilly and grey day was chillier and greyer. Kensington Palace, set in its own park at the end of the commercial row, was not looking its best. Damn. I should have taken a photo of the straggly garden with odd bits of rubbish that Cheri pointed out, presumably neglected because of the reconstruction work that was going on. I missed an opportunity there. 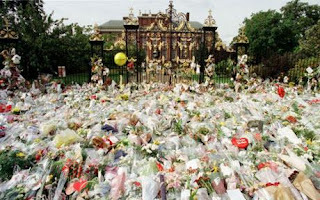 The last time I had visited, the gate was festooned with ribbons, flowers, and notes written to Diana, years after her death. I forget what time of year that was, but it was warm, and may have been around 31 August, the day she died, or perhaps her birthday in July. UK commentators still find the public outpouring of grief difficult to fathom. Kensington Palace has a fair number of claims to fame besides housing Diana from 1981 to 1997 and now key items from her wardrobe. It was converted from a private residence to a palace by Sir Christopher Wren for William and Mary; Queen Victoria was born here; her sculptress daughter Louisa occupied a suite of rooms for years, as did Princess Margaret from 1960 to 2002. The palace is carved into apartments, several of which are still enjoyed by royals of one sort or another, whose minimal rents were a subject of public outcry a few years ago. It was too late for a tour to seem worthwhile, so instead we made our way past security and gawped at the huge houses on the street called Kensington Palace Gardens that runs along the park. I didn't realize at the time that this is also known as "Billionaires Row" and houses not only embassies but some of the wealthiest residents of London. The Wikipedia entry for the street lists occupants house by house. We should have had this printed out and in our hands, Cheri. However, we didn't know we'd end up on Kensington Palace Gardens, and I also didn't know that we'd emerge at the other end to find Notting Hill Gate in front of us. If only I had been a true royal watcher, I'd have remembered that William and Harry went to nursery school in Notting Hill (thanks again, Wikipedia) and I wouldn't have been so surprised. Being right near Portobello Road, of course, we made a slightly zigzag beeline straight there to peer into the antique shops, most of which—luckily for Hans-Jörg and Michael—were being shut down for the night. The only photos I took were of the clothing store All Saints. Unlike the one near Spitalfields Market, this branch had the sewing machine collection that Cheri had admired in their Berlin outpost. Again we abstained from buying anything and wended our way home, sharing an umbrella and feeling (relatively) virtuous.